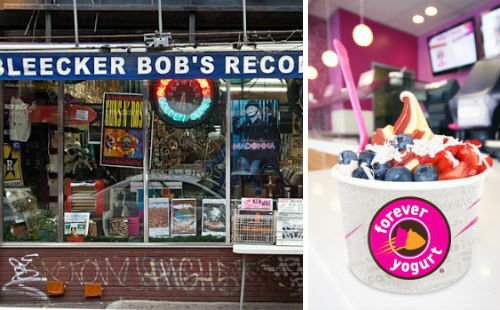 Bleecker Bob’s Might Get a Counter Inside Forever Yogurt! Longstanding record store Bleecker Bob’s has had a rough past year. In early 2012, the Times reported that, after decades in business, the shop might turn into a Starbucks. Fortunately, the Starbucks rumor turned out to be false, but Bob’s will indeed have to close sometime this year. Unless, however, it decides to share a space with the frozen-yogurt chain that’s planning to move in this summer. DNAinfo writes that the national fro-yo yogurt chain moving into Bob’s storefront has offered it some counter space. Forever Yogurt’s CEO Mandy Calara explained: “We’re talking with them about a counter with their inventory. And we’re decorating the place so it carries on the design of Bleecker Bob’s.” Which to be honest, sounds pretty weird.